Dock levellers are designed to make agile the operations of loading and unloading merchandise in the docks of the warehouses, Stores or Distribution Centres. Its intention is to obtain a bridge between the level of the trailer and the warehouse floor, compensating the variations of altitude among them. 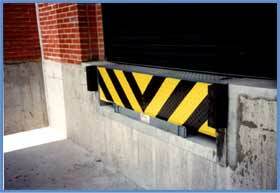 Due to its spring based design, as the trailer lows or raises of level, depending if it is loading or unloading, the Dock Leveller adjusts itself, always assuring the perfect passage between its ends. It is manually operated, which diminishes the maintenance costs because they are limited to lubricate the levies and springs of the mechanical drive. 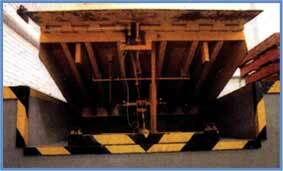 They are made in three different capacities according to the load that are going to handle: of 10, 12 and 15 Tons. The only thing it requires is a pit made in civil work, for the anchorage and positioning of the Leveller. Additionally two rubber defences or protectors settled for protection of the dock walls against the possible bumps of the trucks. For smaller loads, variations are made in the design that allows its perfect operation and its adjustment to the necessities and requirements of the Client.